Ok, we have just created the first step of our library. Now we have hundreds of books, maybe we can dispatch all these books in some categories ? don’t forget the ‘m’ option to run the migration right now ! browse to http://localhost:3000/ and go to the « Categories » tab..
yes ok, nothing really new here. It’s working just like Books. We are going to add the link between Book and Category, knwoing that a category can have many book, and one book belong to one category. we have to generate a small migration to add this field into the Book data model. note: choose the ‘m’ option to apply modifications. and start the server to test ! And choose one of the created book, you can see the new « Category » field at end of page. Click the « edit book » link and you will be invited to change the value for category wich is currently set with the default « (No category) ». ok, back to your code editor and open the file category_hints.rb. and replace all the commented lines by the following single line. Telling that Category has Books has children will modify automatically the Category page, showing the number of book attached to a category. you can see that with very small add to the generated code, you considerably inflect the default behaviour of the application and the links in the model. Even if model link declaration and manipulation already exists in Rails, Hobo brings the corresponding mechanisms for the UI side. 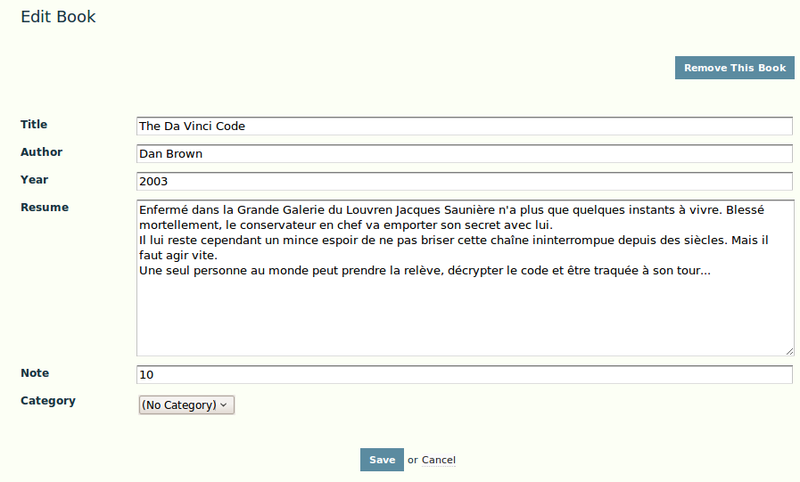 Next, more to be discover in the dryml taglib and tags personalization. Note: please find attached bellow the project in each step state, from step 1 to step 3.